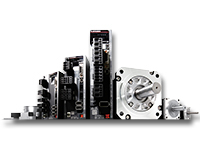 The MR-J4 feature packed servo family provides a well-rounded solution to address key customer and machine builder challenges. The MR-J4 delivers top performance with high speed frequency response, superior synchronization, and vibration suppression. Traditionally difficult programming and setup is also simple with built-in positioning, simple cam function, and advanced One‑touch Auto-tuning that really works. Ease of use, high functionality, and quality make the MR-J4 a great fit for any application. 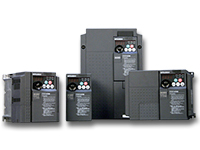 The FR-E700 VFD puts the performance usually associated with high performance sensorless vector control motor drives into a micro-drive package. FR-E700 boasts a 120:1 operating speed range which offers excellent starting torque as well as fast acceleration ramp times. 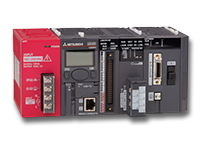 The CC-Link network option allows the inverter to be operated, monitored, and able to change the parameter settings from the PLC. The latest GOT series HMIs offer capability that go beyond just visualization to include functions such as data logging, multimedia capability and embedded communications, blurring the boundaries between HMIs and PCs. Tablet-like usability extends to multi-touch control and gestures, enabling users to easily enlarge content. Today’s HMIs offer increased data and information visibility throughout the enterprise. Instead of simply displaying data, the GOT2000 generation of products delivers genuine perspective on the automation process. 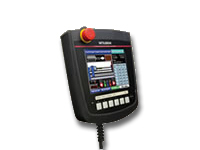 Portable models for special applications where HMI functionality is required at multiple locations. Function keys, deadman switch, and key switch provide added functionality.